The Makerere of today is a product of two historical periods: its early establishment during the colonial period and its reform under neo-liberal influence. I shall begin by asking whether colonialism and neoliberalism are living legacies or pasts that we have moved beyond. Makerere is proud of its colonial legacy. Makerere thinks of itself as the Harvard of Africa. If Makerere was ever the Harvard of Africa, then it was a colonised Harvard. What is the difference between a university that is colonised and one that is independent? Harvard is a research university in a double sense. First, it is a site of research. Second, it produces researchers, not just research. Every research university grows its own timber. The key site for growing timber in a university is its PhD program. Ask anyone at an Ivy League university to identify the heart of research, its vital and dynamic center, and they will point to a range of doctoral programs. A research university articulates research and teaching in a single, organic relationship. Makerere, at least the part of it that I am most familiar with, the College of Humanities and the Social Sciences, has never been a research university. I will take the example of MISR to illustrate my point. 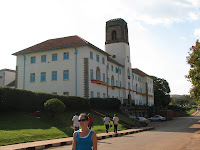 Established in 1948 as East African Institute of Social Research and then renamed Makerere Institute of Social Research a decade later, MISR became a globally known research site. But MISR did not produce researchers. The assumption was that those who would do research at MISR, whether non-Ugandans in the colonial period or Ugandans after independence, would be trained elsewhere. When I joined MISR in 2010, its mission was to do inter-disciplinary research. In 2011, we proposed to the University Senate and Council that the mission be redefined, beyond doing research to training researchers. To be true to the new Mission, we proposed the development of a five-year inter-disciplinary PhD program. With full support from the Vice Chancellor and the DVC (Academic), we began the program in January 2012. We admitted 10 students, 7 Ugandans, 2 Ethiopians and 1 Kenyan. We hired 4 new scholars and now have a PhD teaching team of seven: 4 Ugandans and 3 non-Ugandans, comprising 1 Angolan, 1 American and 1 Italian. We have learnt a number of lessons over the past six months. The most important is that we need to deepen our understanding of what it means to grow our own timber. We could start a PhD program at MISR and borrow the curriculum from Columbia or Harvard. We would then be a satellite station of Columbia or Harvard, but without the creativity that distinguishes those great universities. In the very first semester of our program, we faced the question: what should we teach, at this time and in this place? What should be the content of our curriculum? Our search for an answer to that question has been protracted and I would like to share the milestones in that journey with you. We began by holding a brainstorming session with colleagues in the Humanities and Social Sciences at Addis Ababa University and the University of Western Cape. In 2011, we held five workshops under an umbrella title: Contemporary Debates. The idea was to invite scholars from around the world; not just from the Western world, but from the entire scholarly world, including China, India, and Africa. We identified scholars whose works were defining the terms of the debate in five different fields: Gender in the Public Sphere, Political Economy, Political Studies, Cultural and Literary Studies, and Historical Studies. In 2012, we moved our focus from workshops to lecture series by key scholars. We brought two outstanding scholars, one from China, and the other from India, to MISR. The first of these was Professor Wang Hui of Tsinghua University in Beijing, the renowned author of the three-volume intellectual history titled The Formation of Chinese Thought, written in Chinese. It is about to be published as two volumes in an English translation. He gave us three lectures on his monumental work. The second was Professor Partha Chattejee from the Centre for the Study of Social Sciences, a leading Indian postgraduate institute, you may say a counterpart of MISR, to give a series of lectures on political theory and the Indian School of historiography known as the Subaltern School of History. Next year, 2013, we plan to follow up with four different visiting professors: Professor Bethwell Ogot, a historian from Kenya; Professor Niveditta Menon, a political theorist from India; Professor Siba Grovogui, a legal theorist from Cameroun; and Professor Henry Bernstein, a political economist from SOAS in London. It is through these encounters that we are crafting a new curriculum, a curriculum global in content but crafted from a Ugandan, East African and African perspective. The question of perspective is important because research is not about finding answers to preset questions but about formulating new questions in response to both the evergreen flow of life and ongoing debates in and around the academy. I never tire of reminding my students that key to research is formulating the question that will guide the research. The answer you get depends on the question you ask. And the question you ask depends on who you are, where you are, and the dilemmas that confront you. Our first batch of students will begin to formulate new research questions in 2014 and answer these in the course of 2015. We hope to graduate the first batch of nine PhDs at the end of 2016. From then on, we shall graduate 10 PhDs every year. MISR is a part of the College of Humanities and Social Sciences. The College is the part of Makerere that embraced neoliberal reforms in the most uncritical and unthinking manner from 1990. Not surprisingly, most students at Makerere are enrolled in the College of Humanities and Social Sciences. The neoliberal project has transformed the life of both students and lecturers in the College. I will borrow a Malthusian metaphor to make my point: the rise in student admissions at the College of Humanities and Social Sciences (CHUSS) over the past decade and a half has been geometric, but the increase in the teaching staff and the physical facilities has been arithmetic. Not only have lecture halls burst at the seams, there are no more tutorials. The life of lecturers has also changed dramatically. Payment varies depending on the number of hours each lecturer teaches; the result is that the teaching load of an average lecturer resembles that of a secondary school teacher. In addition, almost every activity has been monetised. You get paid an allowance to invigilate an examination or to mark a script, even to attend meetings: whether of the department, the faculty, the College, or the Senate. Though not all meetings are paid for as sitting or transportation allowance, the general practice is that the higher your designation, the more likely you are to receive an allowance. Newspapers recently carried a story of the millions that have been paid out as allowances to the Search Committee for the Post of Vice Chancellor. I have taught at Columbia for 12 years and have participated in all sorts of committees, from those that have worked only a few hours to those that lasted years. Neither I nor any other member of the teaching staff was ever paid for this work. It was called Good Citizenship. To return to Makerere, not only has the dramatic expansion of the past decade and a half been at the expense of quality education, it also makes little financial sense. All the financial data available shows that the cost of educating an undergraduate at Makerere exceeds the fees paid by undergraduates, no matter the Faculty. This is why Makerere keeps asking government permission to increase fees. On its part the government keeps on reminding Makerere that this is a public university that benefits from government funds and cannot increase its fees to a level that is unaffordable for most Ugandans. I am with the government on this. But I go a step further. We need to rethink the entire neoliberal logic that has governed Makerere since 1990, whereby we think of success in terms of quantity rather than quality, numbers rather than scholarship. I ask myself: what role can MISR play in transforming the life of students and lecturers in the undergraduate college? What would it take to turn the PhD program at MISR into a resource with which to revitalise undergraduate education in the College of Humanities and Social Sciences at Makerere? I have two very practical suggestions. My first suggestion is to reduce the undergraduate admission at Makerere, and to do so substantially. Wherever there are large lectures, our aim should be to combine these with tutorials. Every great university taps its doctoral students for a supply of tutors. MISR expects our PhD students to spend half of their third year as undergraduate tutors in different departments at the College. Starting in 2014, our ambition is to make tutorials an integral part of the undergraduate program at the College. To produce quality students requires quality teachers. Good teachers do not work because of how much they are paid. But they need to be paid enough to be able to work with diligence. Teachers are not business people, and those with an eye on making money should go to Kikubo, not to a university. The important thing is to reform the motivational structure at Makerere so it attracts and rewards scholars, and discourages and keeps away those who wish to mint millions. That would mean, for a start, that we pay people meaningful salaries for their main work – teaching and research – and not allowances for attending endless meetings. I was glad to hear the Prime Minister say in his opening remarks that government intends to triple budgetary allocation to institutions of higher learning over the next few years. My second suggestion is that Makerere abolish all allowances for attending meetings, all payments for invigilating or marking scripts, and use the money saved to increase salaries of those who teach and do research, and those whose services support this core activity. My guess is it will do away with 90% of meetings, and dramatically reduce the time taken by meetings that do take place. It may not increase salaries substantially, but it will surely send the right signal to all concerned. The starting point of the critique of neoliberalism in higher education is to recognise that a university is not a business corporation but a place for scholarly pursuit. Its objective is to maximise scholarship, not profits. It is true that no one who lives in this world, even those with otherworldly pursuits like religious organisations, can afford to be blind to financial constraints and that a university is no exception to this rule. But if scholarship is indeed our core mission, then we must be prepared to subordinate all other considerations, including the financial, to the pursuit of scholarship. To forget this would be to lose our way. Article by Prof. Mamdani who is the executive director of the Makerere Institute of Social Research. He made this presentation on Aug. 3 at the 4th Makerere University Stakeholders Consultative Meeting.